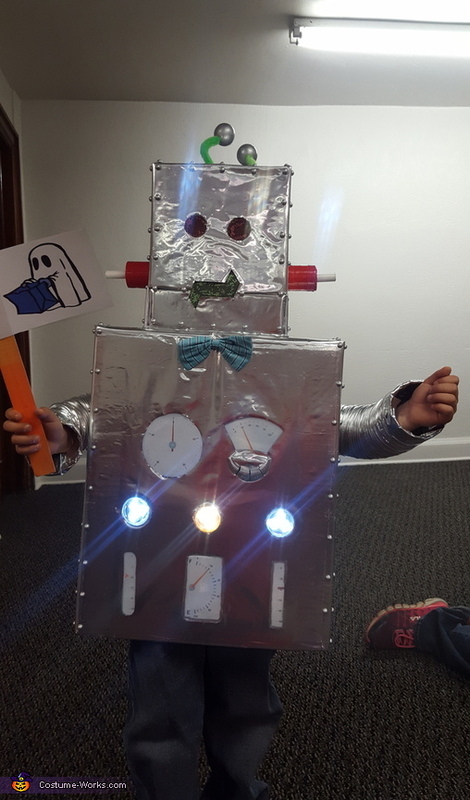 I made my 5 year old son a robot costume this year. I handmade all my kids costumes every year. I started with a diaper box and covered it with a silver garden foil paper. I printed some gears online and laminated them and cut out exact holes to fit them in. I used 3 LED push lights in front that work. The back I laminated a gear sheet and added toy gears that you can spin. For the face I cut some window screen and put that over the eye and mouth holes. I also got some pearl stickers and painted them silver for the rivets all along the sides and head. He really enjoyed this costume and I will be keeping it for my 2 younger boys as well! Thanks!